A program that brings people with disability together with a volunteer advocate to reflect on the Eucharistic celebration through sharing and song has resulted in firm friendship for Rose Tricoli and Joe Pinzone. Source: eRecord. 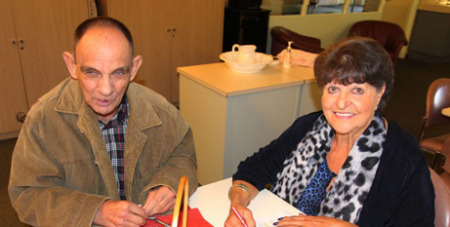 Rose was introduced to Joe in 1995 through a program offered by Personal Advocacy Services (PAS) at Infant Jesus, Morley Parish in Perth. Sister Eileen Casey, founder of Catholic Archdiocese of Perth agency PAS, initiated the Special Religious Development (SPRED) program after encountering a similar initiative during a visit to the United States of America. The purpose of the program is to bring people with disability together with their volunteer to advocate discussions about different spiritual themes, and reflect on the Eucharistic celebration through sharing and song. For Joe, who joined in 1994, the program has been life changing. Each week, they catch up with each other and on alternative weeks they attend PAS. “It has taught him some wonderful life skills in a calm and gentle way which has made a great difference to his confidence and the way he interacts with others,” Rose said. They both enjoy being out and about in the community, which includes visits to Rose’s family café, where he gets to interact with staff and customers. Rose regularly invites Joe to her family home where he is always welcome to enjoy meals and chats with her husband Charlie and their four children. “He loves being with us and we love him being part of our lives too. He has contributed so much to our family,” she added. Joe said he enjoys visiting Rose’s house. “I like talking to her and helping do jobs with her, and I really like eating her banana cake,” he said.